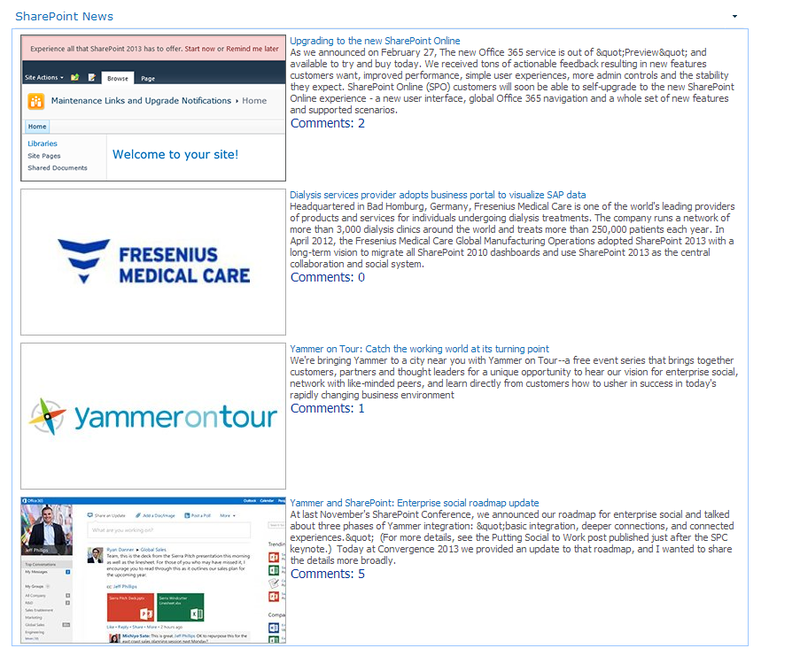 Using social comments in Publishing pages is pretty common scenario for SharePoint Publishing Sites. In comparison to page fields (Page Content, Title, Page Image and etc.) that are inserted into the “slots” of the page layout and associated with the content type of the publishing page, social comments are stored separately. Social comments are stored in separate DB and the comment entry is associated by the page Url on which comment has been given. 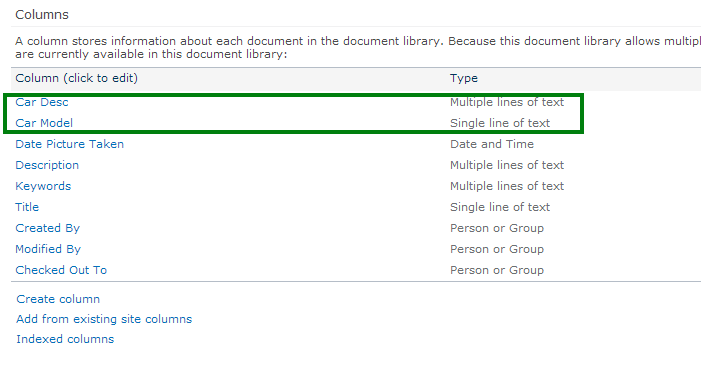 Let’s take a look at several approaches how to display social comments for Publishing pages in Content Query web part as shown on picture below. Prerequisites: to enable social comments in Publishing pages the custom page layout with Note Board web part is used for demonstration here. In this approach the social comments are retrieved and saved in results before it is sent to the XSL transform using ProcessDataDelegate delegate of Content Query web part. 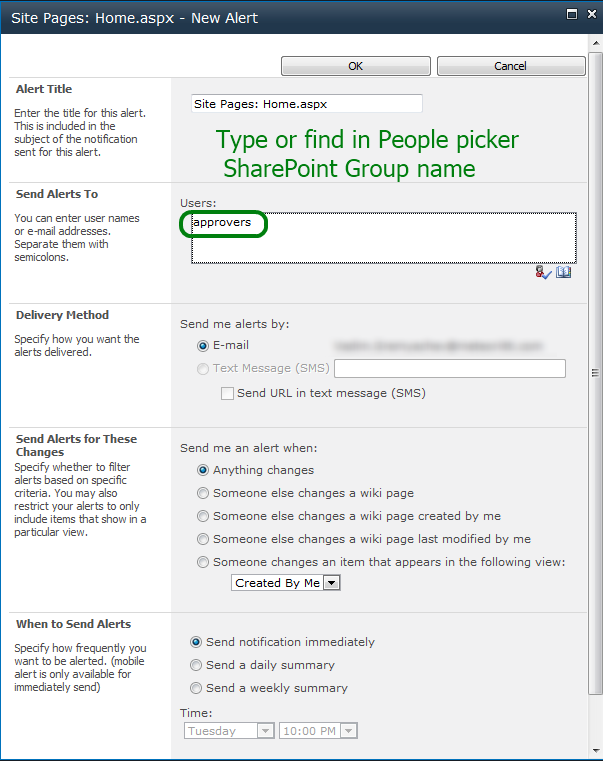 For retrieving social comments, SocialCommentManager class is utilized, which represents the entry point in SharePoint object model (OM) that exposes methods to do work with social comments or notes. In this approach we are not going to subclass Content Query web part, but implement social comments retrieving and binding on the client side. 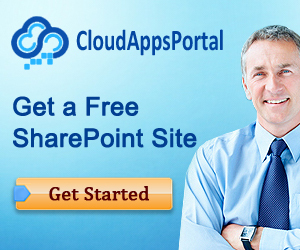 SharePoint Web Services exposes Social Data Service that provides methods for remote clients to Create, Read, Update, and Delete (CRUD) social data. Below is presented XSLT based approach how to provide additional sorting options for People Search Results web part. 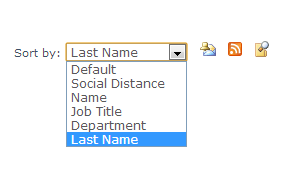 CustomNameSortLabels and CustomNameSortValues are used for storing custom sort option labels and values respectively. In previous post we’ve discussed one of the useful features for TaxonomyWebTaggingControl control that allows to specify ID of parent Term for any valid value in control. 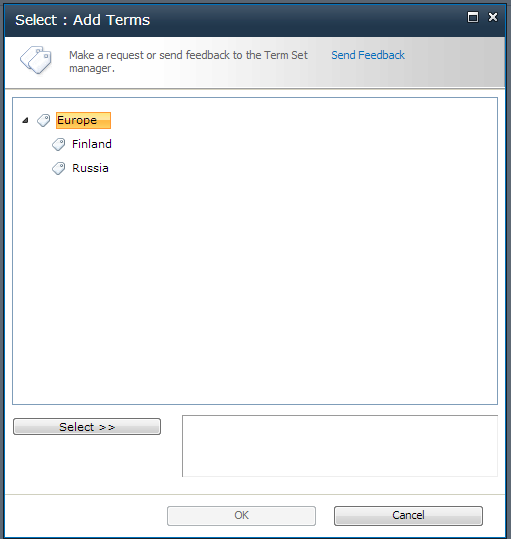 This could improve user experience in cases when subset of terms should be displayed for selection based on some conditions instead of displaying all terms from term set. This time we will dig in a little bit to investigate how TaxonomyWebTaggingControl works and illustrate some examples how to access and manipulate TaxonomyWebTaggingControl on the client side. Before we proceed let me clarify some details about TaxonomyWebTaggingControl control itself. TaxonomyWebTaggingControl ASP.NET control is a server side wrapper for ScriptForWebTaggingUI client control. One of the main purposes of TaxonomyWebTaggingControl control is to provide the ability to initialize ScriptForWebTaggingUI control by generating parameters on the server side (see table 1). Table 1. ScriptForWebTaggingUI client control properties . AllowFillIn Gets or sets whether this control will give the option of adding new Term objects if the Open() property is set. WidthCSS Gets or sets a CSS class that will be applied to the control that should specify a width CSS class. Lcid Gets or sets the LCID repesenting the language this control will validate against. IsSpanTermSets Gets and sets whether this control will resolve against all TermSet objects or only the TermSet objects provided. IsSpanTermStores Gets or sets whether this control will resolve against all TermStore objects or only the TermStore objects provided. IsIgnoreFormatting Gets or sets whether this control will format valid and invalid Term objects or leave them as plain text. IsIncludeDeprecated Gets or sets whether this control will resolve against deprecated Term objects. 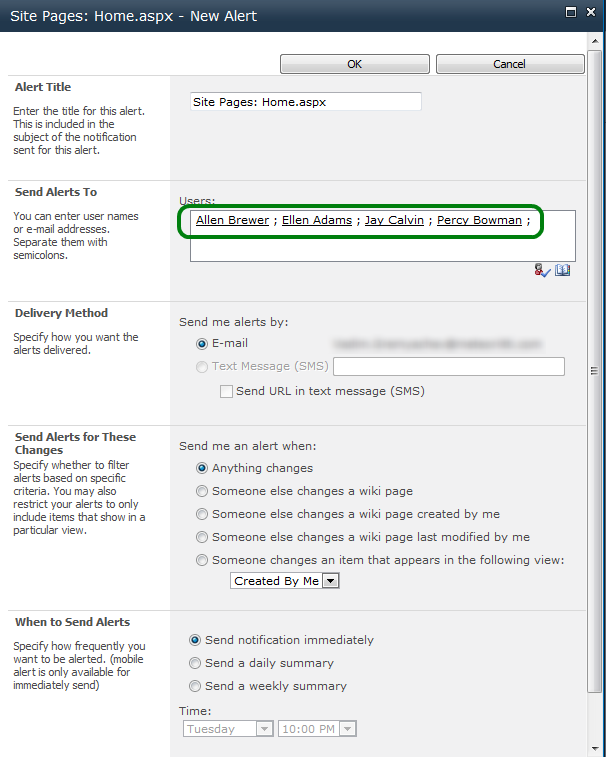 IsIncludeUnavailable Gets or sets whether this control will resolve against unavailable Term objects. IsIncludeTermSetName Gets and sets whether this control will resolve against the names of TermSet object names. IsAddTerms Gets and sets whether this control will try to add unresolved Term objects to the TermSet object. IsIncludePathData Gets or sets whether this control will include the full GUID path for all Term objects. IsUseCommaAsDelimiter Gets or sets whether this control will use a comma in addition to a semi-colon as a delimiter. Relevant properties for server side TaxonomyWebTaggingControl control are listed here. To find TaxonomyWebTaggingControl on the client side webTaggingId identifier is used, that corresponds to ContainerId property of control. TaxonomyWebTaggingControl represents a generic Web control for picking managed metadata terms. This could be achieved by setting AnchorId property for TaxonomyWebTaggingControl control that allows to specify ID of parent Term for any valid value in control. 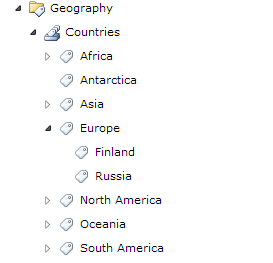 Country picker allows to select continent/country from Countries term set.